A senior jihadist militant has reportedly been killed in a US air strike in north-western Syria. Abu al-Faraj al-Masri died in Idlib province, according to a statement from Jabhat Fateh al-Sham, which was known as al-Nusra Front until it formally broke off ties with al-Qaeda in July. Masri, an Egyptian cleric, served on the group's Shura Council. A Pentagon statement confirmed a US air strike had targeted him, but said that it was "still assessing the results". Masri was "one of al-Qaeda in Syria's most senior leaders and a legacy al-Qaeda terrorist who previously had ties to Osama Bin Laden", it added. 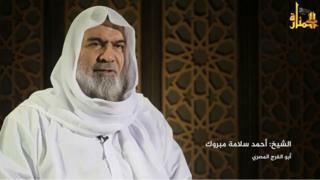 "His death, if confirmed, would disrupt and degrade co-ordination among senior [al-Qaeda] leaders and extremists. The United States military will continue to target." Who are Jabhat Fateh al-Sham? The Syrian Observatory for Human Rights, a UK-based monitoring group, reported on Monday that Masri was killed when the vehicle he was travelling in was hit near the border with Turkey. Jabhat Fateh al-Sham is one of the most powerful armed groups seeking to overthrow the government of Syria's President Bashar al-Assad. In July, its leader Abu Mohammed al-Jolani claimed he was ending its affiliation with al-Qaeda and forming a new body with "no ties with any foreign party". But analysts dismissed it as a public relations move, and the US immediately said it would continue to target the group, which is designated as a terrorist organisation by the UN. Masri, whose real name is Ahmed Salama Mabrouk, appeared alongside Jolani in the video announcing the name change. Russia, which backs Syria's president, has accused the US of sparing Jabhat Fateh al-Sham and of failing to persuade the mainstream rebels it supports to distance themselves from the jihadist group. Last month, Jabhat Fateh al-Sham's top military commander was killed in an air strike in the northern province of Aleppo. Syria war: Who are Jabhat Fateh al-Sham?